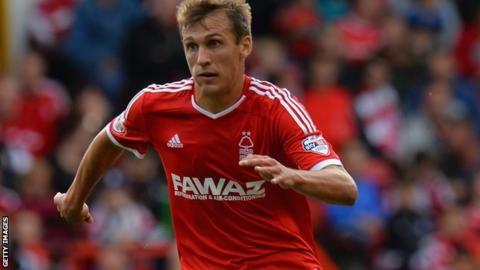 A 22-yard volley from German midfielder Robert Tesche earned Nottingham Forest a 1-1 draw with Charlton Athletic. Callum Harriott had put the visitors ahead in the 10th minute with a long-range deflected effort. But former Hamburg man Tesche ensured Stuart Pearce's men were not beaten with a fine shot into the top corner. The draw is the visitors' 11th of the season and leaves them in 11th place, while inconsistent Forest drop to 10th. Bob Peeters' men had been the better side in the first half and could have doubled their lead if not for the brilliance of Forest keeper Karl Darlow. The on-loan Newcastle stopper showed outstanding reactions to parry after Igor Vetokele had connected powerfully with a diving header at close range. Forest's Eric Lichaj was alert enough to block substitute Lawrie Wilson's attempts to drive home the rebound. The second half, however, was a different story. Jamie Paterson, Michail Antonio and Dexter Blackstock all came close for a resurgent Forest after substitute Tesche had levelled. Blackstock, who came off the bench, forced a save from Charlton's Nick Pope with a towering header, while the keeper also held a low shot from Antonio and Paterson shot wide as Forest piled on some late pressure but to no avail. Nottingham Forest manager Stuart Pearce: "In the first half we had no desire, no devilment, no oomph - we had a real nervousness about our play. "In the second half, it was a total contrast. The players went out, got on the front foot and showed desire and energy. "We had one or two reasonably critical words at half time, but they were constructive ones. We mainly just told them that they were doing themselves a disservice." Charlton Athletic manager Bob Peeters: "It was a good point. In the first half we might have taken a 2-0 lead but we stood our ground pretty well, amid a lot of pressure from Forest, who had their crowd behind them. "I don't think they had too many chances, it took a cracking goal to get them a point. We feel we might have won the game, overall." Match ends, Nottingham Forest 1, Charlton Athletic 1. Second Half ends, Nottingham Forest 1, Charlton Athletic 1. Attempt missed. Matty Fryatt (Nottingham Forest) header from the left side of the six yard box is too high. Assisted by Jamaal Lascelles following a corner. Attempt missed. Jamaal Lascelles (Nottingham Forest) header from the centre of the box misses to the left. Assisted by Ben Osborn with a cross following a corner. Corner, Nottingham Forest. Conceded by Morgan Fox. Substitution, Charlton Athletic. Frédéric Bulot replaces Johann Berg Gudmundsson. Offside, Charlton Athletic. Chris Solly tries a through ball, but Lawrie Wilson is caught offside. Foul by Johann Berg Gudmundsson (Charlton Athletic). Offside, Nottingham Forest. Jamie Paterson tries a through ball, but Michail Antonio is caught offside. Attempt missed. Jamie Paterson (Nottingham Forest) right footed shot from outside the box is close, but misses to the right. Assisted by Dexter Blackstock with a headed pass. Attempt saved. Michail Antonio (Nottingham Forest) right footed shot from outside the box is saved in the centre of the goal. Robert Tesche (Nottingham Forest) wins a free kick in the defensive half. Corner, Charlton Athletic. Conceded by Ben Osborn. Attempt saved. Dexter Blackstock (Nottingham Forest) header from the centre of the box is saved in the centre of the goal. Assisted by Robert Tesche with a cross. Foul by Michael Mancienne (Nottingham Forest). Johann Berg Gudmundsson (Charlton Athletic) wins a free kick in the defensive half. Substitution, Nottingham Forest. Dexter Blackstock replaces Tom Ince. Attempt missed. Jamie Paterson (Nottingham Forest) right footed shot from the right side of the box is too high. Assisted by Michail Antonio. Corner, Charlton Athletic. Conceded by Jamaal Lascelles. Robert Tesche (Nottingham Forest) is shown the yellow card for a bad foul. Foul by Robert Tesche (Nottingham Forest). Jamie Paterson (Nottingham Forest) wins a free kick in the attacking half. Attempt missed. Robert Tesche (Nottingham Forest) left footed shot from outside the box misses to the left following a corner. Corner, Nottingham Forest. Conceded by Chris Solly. Foul by Matty Fryatt (Nottingham Forest). Attempt missed. Lawrie Wilson (Charlton Athletic) right footed shot from outside the box misses to the left. Assisted by Igor Vetokele. Attempt saved. Callum Harriott (Charlton Athletic) right footed shot from the right side of the box is saved in the centre of the goal. Assisted by Igor Vetokele.